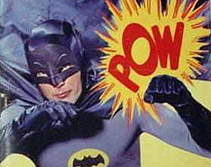 Holy Cow Batman, President Barack Hussein Obama at 41% job approval in the latest USA Today/Gallup poll. Obama, stuck between a Barack and a hard place. Obviously by looking at these numbers, even Democrats are disapproving of The One’s job performance. Which one will be the first poll to have Obama’s job approval ratings in the 30′s? President Obama got to his low job approval rating the old fashion way … he earned it! Only 41% of those surveyed Tuesday through Sunday approved of the way Obama is handling his job, his lowest rating in the USA TODAY/Gallup Poll since he took office in January 2009. In Gallup’s separate daily tracking poll, his approval was at 45% Monday. The waning support for the Afghanistan war coincides with the deaths of a record 66 U.S. service members in July, up from 60 in June. As the last of 30,000 reinforcements ordered by Obama enter the country, the international military force is encountering heavy Taliban resistance in the southern provinces of Kandahar and Helmand. Obama says that there will be troop draw down in Iraq as planned, does any one on either side have confidence in this President? This President cannot defend our southern border with Mexico, makes one wonder how he defines victory in war other than politicizing it. As Obama claims … Mission re-accomplished. No wonder Democrat politicians are running away from Obama when he comes calling to town and the best thing Obama could do for Democrats is endorse the Republican candidate. I like the choice of photo is this article. It reminds me of a time when right was correct and wrong was incorrect. Our government is upside down. I think they forget that they are employees of the people, not rulers of the people. What I want to know is who are the 41% that approve? The new govt employeees or the monkeys they spent close to 75 thousand of the stimulus on, giving them cocaine for tests? Tax dollars at work.. These people are so out of touch with the majority of the people. This campaign season Obama and the children of the corn are going to STILL blame bush for all of Obamas failures and the GOP is simply going to point out that the dems are the party of “WTF?” and point out all the wastful spending and lack of job creation. Should be a doosie. #3 They are the entitlement crowd and those on the government dole. Obama, Pelosi, & Reid have done more harm and change to this country in the past two years than the Russians tried to do 40 years.